Mortgage rates are flat this week, which is good news for homebuyers looking to buy or refinance. Plus, existing-home sales climbed in March, signaling a promising start to a busy spring home selling season. 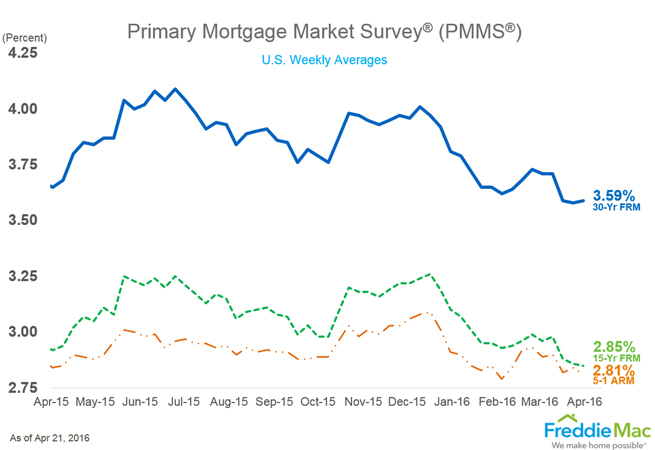 30-year fixed-rate mortgages averaged 3.59% with an average 0.6 point for the week ending April 21, 2016. A year ago, the rate averaged 3.65%. 15-year fixed rates averaged 2.85% with an average 0.5 point. The same term priced at 2.92% a year ago. 5-year adjustable-rate mortgages priced at 2.81% with an average 0.5 point. Last year at this time, the same ARM averaged 2.84%. Meanwhile, low mortgage rates gave loan applications a slight bump of 1.3%, according to the Mortgage Bankers Association weekly report ending April 15, 2016. Refi applications gained 3%. Overall, home purchase loan applications are 17% higher than the same week one year ago. There’s good news for buyers and sellers alike on the spring sales front. In March, total existing-home sales rose 5.1% to a seasonally adjusted annual rate of 5.33 million in March from 5.07 million in February, according to the National Association of Realtors. That said, first-time buyers, who accounted for about 30% of activity in March and all of 2015, are not jumping into the market in droves because they’re hampered by the low availability of starter homes and rising home prices. Sellers will be happy to know that the median existing-home price in March jumped 5.7% year over year to $222,700. Housing experts hope that more sellers will enter the market to help add more affordable starter homes to the market for first-time buyers.